Germany has ordered the arrest of 13 suspected CIA agents over the alleged kidnapping of one of its citizens. Munich prosecutors confirmed that the warrants were linked to the case of Khaled al-Masri, a German national of Lebanese descent. Mr Masri says he was seized in Macedonia, flown to a secret prison in Afghanistan and mistreated there. He says he was released in Albania five months later when the Americans realised they had the wrong man. Mr Masri says his case is an example of the US policy of "extraordinary rendition" - a practice whereby the US government flies foreign terror suspects to third countries without judicial process for interrogation or detention. Prosecutors in Munich said in a statement that the city's court had issued the warrants on suspicion of abduction and grievous bodily harm. The information on which the warrants were based came from Mr Masri's lawyers and a journalist and officials in Spain, where the flight carrying Mr Masri is thought to have originated. The names and nationalities concerned were not released but prosecutors said the names identified were thought to be the code names of CIA agents. "The investigation will now focus on learning the actual names of the suspects," they said. Speaking at a news conference, Mr Masri's lawyer, Manfred Gnjidic, said the arrest warrants were "a very important step in the rehabilitation of Masri". "It shows us that we were right in putting our trust in the German authorities and the German prosecutors," he said. German arrest warrants are not valid in the US but if the suspects were to travel to the European Union they could be arrested. 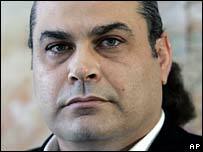 Mr Masri says he was abducted by US agents in the Macedonian capital, Skopje, on 31 December 2003. He is seeking to sue the US government over his detention, but in May a judge dismissed a lawsuit he filed against the CIA, citing national security considerations. The US government is not assisting the German authorities with the case. Meanwhile in the Italian city of Milan, court hearings to decide whether to indict 25 alleged CIA agents and several Italians accused of kidnapping a Muslim cleric in 2003 are under way. Osama Mustafa Hassan, or Abu Omar, says he was abducted from the streets of Milan and then tortured in Egypt. If the case proceeds to trial, it would be the first criminal prosecution over America's rendition policy. The practice has drawn widespread criticism from human rights groups, legal experts and the international community. But last week a European Parliament committee approved a report saying EU states knew about secret CIA flights over Europe, the abduction of terror suspects by US agents and the existence of clandestine detention camps.